WellBe by Adrienne Nolan-Smith. Helping connect wellness to healthcare. The WellBe Guide to gut health is here! Our most comprehensive guide ever, full of information and actionable tips so you can start healing your gut today. Alkaline, mineral, reverse osmosis — there are a lot of different kinds of water out there. In our guide, we break down what each kind of water means for your health. Kelli Tennant was a Division I athlete and in the best shape of her life when suddenly she became bedridden. Over the course of 13 years, she overcame an incorrect fibromyalgia diagnosis and found health. Hi, I’m Adrienne. I’m a speaker, board certified patient advocate and the founder of WellBe. I’ve had some tough experiences in the healthcare system, but they made me dedicate my life to helping you prevent chronic health issues, and heal them naturally when they arise. WellBe is my greatest mission and my life’s work. How WellBe are you? TAKE THE QUIZ If you don’t know where you are, you can’t go somewhere better. Start your WellBe journey now. What’s the Best Water Filter For Your Health? In July 2017, the Environmental Working Group (EWG) published their database of pollutants found in American tap water. By entering your zip code, you can research what contaminants have been found in public water systems. So now what? We looked through the EWG’s water filter guide to find some products that are certified to filter out contaminants found in Boston, Chicago, Los Angeles, and New York City. Dr. Jonathan Aviv spoke with WellBe about acid reflux, esophageal cancer, GERD — and how to heal from them with an anti-inflammatory diet. Imagine suffering from range of ailments that totally controlled your childhood and then having a psychotic breakdown at 18 that led to institutionalization. For Ally Hilfiger, now 32, that was the reality of the bulk of her childhood. When she was 7, Hilfiger was bitten by a tick, but not diagnosed with chronic Lyme disease until 19. For all those years in between, she had to deal with severe fatigue, joint pain, difficulty retaining information, fainting spells, shooting pains, migraines, and serious anxiety attacks. No one could figure out what was causing her physical and neurological complications. Adrienne moderated a panel on how indoor air pollution affects chronic disease. Panelists included Integrative MD Dr. Taz Bhatia; Sacha Dunn, founder of Common Good; Nneka Leiba, Director of Science at the Environmental Working Group; and Christopher Satch, head plant scientist at The Sill. Get the panel recap here! Adrienne was a panelist for “Women Challenging Convention” co-hosted by Johns Hopkins University and The Assemblage NYC. 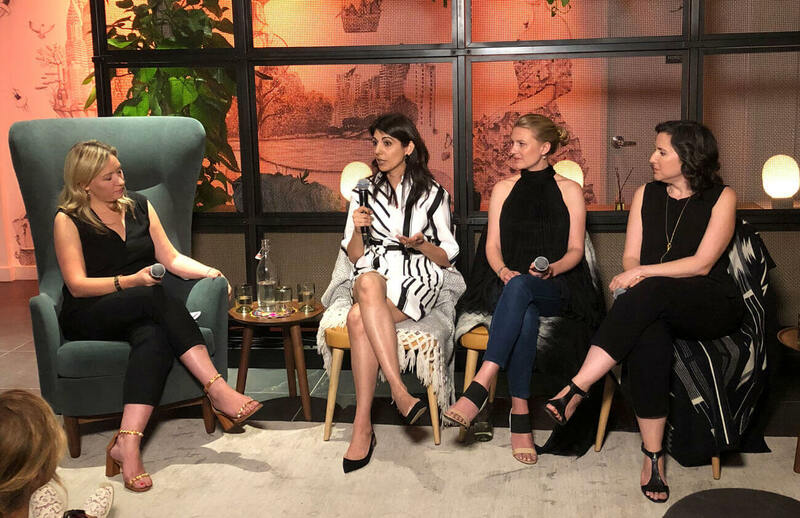 The panelists were asked to discuss nontraditional career paths to addressing various gaps in health and wellness, maintaining wellbeing while challenging convention, and what gave rise to the wellness movement.